This article will go over the two check boxes found under the Customer Permissions bubble. 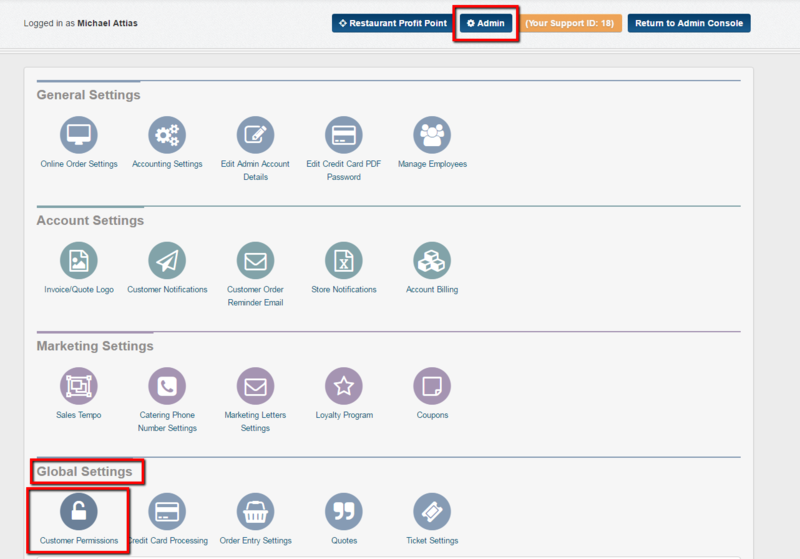 1 - Click on the Admin tab - look for the Global Settings sections - click on the Customer Permissions bubble. 2. Once you click on the bubble a box will appear with the two types of permissions you can give to the customer. 3. If you allow customer to place orders online and you would like for them to be able to delete orders then check this box off. By default the box will be un-checked NOT allowing customers to delete orders on their own. You will NOT receive a notification that the order has been deleted but it will be removed from your calendar. 4. If you have more then one location and you want the location that is selected as the customers primary location in the CRM (screen shot 2) to automatically show up as the location to place the order under then check this box off. By default the box will be un-checked allowing the customer to choose the location from a drop down box when first logging in. These are the two permissions found under the Customer Permission bubble.